Mentorship is a time-proven way for providing guidance and creating awareness of new pathways for young people. Now, more than ever, the need for mentors is great. From today’s rapidly changing world, influenced daily by technology, to figuring out how to make sense of complex issues, young people benefit by having a trusted mentor to turn to for advice. There is a lot to be said for having a champion in your corner, one who will cheer you on and help when tough times need a steady hand. January is National Mentoring Month, and I find it a great way to make good on a resolution to live a more fulfilling life in 2019. There are many opportunities to serve as a mentor, from engaging in area organizations, such as the Boys and Girls Clubs to working with students in your area’s schools to supporting youth who attend your place of worship to volunteering a few hours a month to serve as a “Big” – that is, an adult mentor in your area’s Big Brothers Big Sisters program. My own experience serving on the board of my local Big Brothers Big Sister (BBBS) program has been incredibly rewarding. The board works to ensure that the BBBS’ mission of providing children, ages 6-18, who are faced with adversity are matched with a “Big” with the goal of creating strong, enduring, professionally supported one-to-one relationships that change their “Littles” lives for the better. Knowing our BBBS team is providing this support for more than 200 young people in our area validates the importance of our collective work. 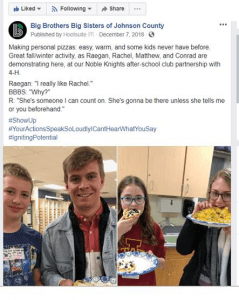 As this recent social media post illustrates, being a mentor is as simple – and important – as showing up, being dependable, and someone a Little can count on. My BBBS program (in Iowa) has been successfully creating, building, and sustaining mentor relationships between committed, compassionate adults and their matched youth for over 40 years. There are a number of ways to become a Big and the need for male volunteers is high. I encourage you to do a little soul searching and see if you can find a few hours a month to become a mentor, friend, and influential adult for a Little. Learn more . What skills or qualifications does an adult need in order to be a good mentor? They must be 18 or older, complete an application that includes background screening and reference checks, and be able to commit to an 18-month relationship. We all have things to share with a child, but being committed to meeting with your child (six hours/month for Community-based, and one week during the school year for School-based) for 18 months is critical. So is being a good listener with the willingness to be open to learning about other’s lifestyles and cultures and sharing yours. What does a mentor do for a child? Mentorship is really as simple as spending time with a young person, doing things you both like to do, trying new things, encouraging them to be the best they can, and being someone they can talk to. How much time does one have to dedicate to be a mentor to make a positive impact? We require six hours a month for 18 months in our Community-based program, or one to one and a half hours a week during the school year for 18 months. What impact do you see in children because of a mentor? Children who are mentored have improved grades, less truancy, higher education expectations, and do better scholastically. They also are 77 percent more likely to avoid risky behaviors such as substance abuse, hitting, breaking school rules and involvement in juvenile justice. Daleta Thurness is the executive director of Big Brothers Big Sisters of Johnson County. 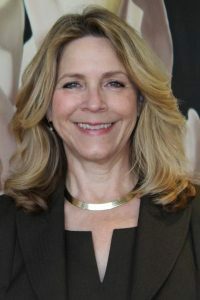 She is a graduate of the University of Iowa and has over 20 years of experience in child advocacy.